Yeah, it gives you a little more of an idea what really goes on in the Centauri royal court. And since Refa was the one behind the resolution against Urza, you get a bit more of a sense of what kind of guy he is and what he's up to. I looked over the writing credits a few days ago, and I realized that Larry DiTillio and Peter David led the credits at seven episodes and three, respectively, in terms of people who weren't JMS writing. A bit of an overdue nitpick. But Peter David only did two - Soul Mates, and A Matter of Honor. A "C" was given. It was entertaining but forgettable. It was entertaining. I enjoy finding out things about the races, and this one certainly taught us something about Centauri customs. Londo is a lot of fun as always. It seems I can chime in with most of the previous posts - this was an enjoyable episode, but not one of the important nor best ones. The Centauri information does further the story arc, but the Sheridan plot lacks fascination. Baseball in space, an unidentifiable lifeform (It's life, Jim, but not as we know it...), dream images that attempt to communicate - all really more Star Trek than B5. What I did like was something that shows up every once in awhile - grapple hooks instead of non-material (and therefore unrealistic) tractor beams. The aspect of self-sacrifice is one that shows up frequently on the show. Urza sacrifices himself for his family, and Londo brings the sacrifice of killing his friend for the better good. There are a couple of nice Vir moments - the opera arias at the beginning are amusing, with both of them singing and Vir apparently winning the argument. Like the viewer, he finds something in Londo's character to admire in this episode. And he is the voice of Mollari's conscience at the end, not for the first or last time, telling him that it's not too late to make new choices. I wonder, could Londo have done so? Theoretically, yes, but would his character traits allow him to? I watched this episode today. It's more of a standalone episode with some minor arc stuff in it, but, as mentioned by Estelyn, it has one of the major themes of the show: self sacrifice ("Quickly, what is the third principle of sentient life?"). I like that recurring theme in that it binds all the different races together in a way. As Maneth said upthread, it's interesting to learn more about the various races. Centauri society is an interesting one. 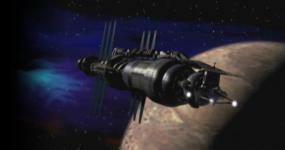 Not that there any UNinteresting societies in the Babylon 5 universe. The Centauri appear to have some very rigid social rules. I'm vaguely uncomfortable with the idea that cultures who embrace concepts like blood oaths (Narn) and duels to the death (Centauri) are technologically advanced enough to be space-faring (and then some). But, I'm never entirely sure about the Centauri. It is possible they are trying to recreate some former glory and have gone back to duels and such in the somewhat recent past. It's hard to think of them as anything but imperialistic, but perhaps they enjoyed more progressive periods in their history. Well, there is a debate as to whether there is a correlation between technological progress and cultural progress. Steven Pinker in his book Better Angels of our Nature outlines a rather convincing case that humanity is becoming more peaceable as we become more developed, although I'm not necessarily convinced that technological progress always makes a society more... sensible, for want of a better word. There must be other factors involved too. The Narns got a shortcut to their technology - they reverse engineered Centauri tech, so maybe their culture has yet to catch up. The Centauri on the other hand have had their glory days and have now become decadent, falling back on old ideas and a strange sense of honour above common sense in their effort to rekindle those old glories. As we saw, this way – Londo's way – led them down the path of destruction. Vir's way, which I doubt would have involved duels to the death, was the way forward. You're quite right, technological advances don't necessarily correlate with changes in values, and "progress" is a complicated concept. Technological advances do occur in unequal societies with limited individual freedom. Otherwise we, in the real world, wouldn't have gotten to this point, where we can have this conversation. But, I think such progress would be a lot easier in a more equal and free society. Centauri society is apparently quite patriarchal. We never see any Centauri women in government. To be fair, Centauri patriarchy could be a system where scientist is an acceptable job for women, but it probably isn't. Especially not seeing how Londo's nephew was put in the position of lead scientist at Ragesh III. In a system like that, 50-ish percent of your society's brain power is automatically excluded from working on things. Then, among the 50 percent of people who could potentially be working on things, you have people legally killing each other in duels. All of this against the background of scheming that is Centauri politics. It's amazing they ever get anything done at all! You could explain it by saying that the Centauri have taken a VERY long time to get where they are (Which may or may not be a known thing. *I* don't know), or that they have indeed gone back to older ways of doing things. I know that the humans got jumpgate technology from the Centauri, but I don't know if they came up with it themselves or got it from someone else also. That could explain things, as well. Maybe the scenario was more like the Narn, which, as you say, had technology thrust upon them they weren't anywhere near close to developing themselves. You know what, upon reflection, I think I was wrong about most of the stuff I said above. I think I was being uncharacteristically optimistic, and it clouded my judgment. I was being a bit real life Earth-centric, too, I think. Interstellar travel seems like sci-fi only. Humans aren't likely to develop such technologies anytime soon. Seems like if they are going to it'll be so far off, I LIKE to think that by that time humans will have sorted out all of that stuff within their own society (societies?). But that's really just me hoping, based on recent progress towards more equality and freedom. Looking at the human past, it is quite clear that technological advances do happen in less than utopian societies. Those societies that have gotten the farthest in terms of space explorations have not necessarily been the most advanced in terms of human rights, freedom, and equality. I have similar thoughts about some of the human stuff portrayed on B5. Earth seems to be doing pretty well for itself at the time the show starts. It seemed unrealistic to me that people were having to pay for medical care on Babylon 5 (Franklin mentions cost of treatment in "Believers", and then there's the free clinic he runs in downbelow in "The Quality of Mercy"), but again that's me basing what I think is realistic on what I HOPE would happen. One thing I'm sure of is that alien contact would have a huge impact on any culture. It's hard to say exactly what kind of impact. That'll depend on the nature of the contact, among other things. Excuse my double post! I didn't see any rule specifically forbidding that sort of thing, but do let me know if I've missed something! SO Knives generated some interesting discussions. In watching the JMS Approved Chronological order I have arrived at Knives just after Hunter Prey, 2.13. I give this episode an A for all of the Centauri stuff. It is all fascinating. Londo learns he needs to keep one eye on home. He learns another price he has to pay for what he has done. He learns more about whom he has gone into business with. There are all kinds of great character moments for Londo and Vir. All and all I would give this part of the plot an A+++. I love the beginning of the Sheridan plot, but I'm not a huge fan of where it goes from there. I do understand that, in part, it was to remind viewers about Sector 14. I think my big issue is that I love the setup for Sheridan. I really wanted to get into him going on his little exploration of the "Triangle" and I would have loved for the episode to just continue with him taking that journey. I felt he found the body a little too quickly, but that is just what the show showed the viewers. He could have been exploring for hours and they just didn't tell us, but they should have. Having said I got very intrigued when he finds the body. Then I kind of lose interest when it becomes a story about an unseen life-form taking control of him. Don't get me wrong, I think the way that is done is brilliant. I like that Sheridan starts seeing signs of danger from his own subconscious, but the concept has a little too much fantastic for the sake of being fantastic in it for me. But in the end it becomes a tool to remind us about the weirdness of Sector 14, so it was well planned and executed.